Final Fantasy; it’s a pretty big deal almost everywhere outside of Xbox. Yes. We’ve had the XIII trilogy and XV also, but Xbox owners have largely missed out of the franchise’s glory days. Today’s announcement is about to change all that. 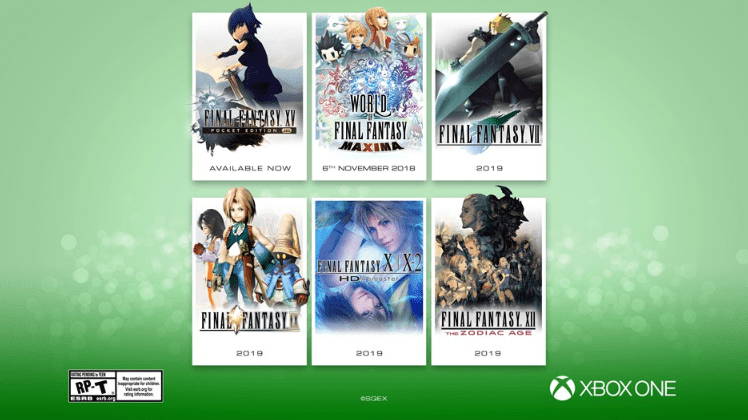 Square Enix have today announced that five classic Final Fantasy titles are arriving on Xbox One over the next 12 months. Starting with World of Final Fantasy MAXIMA, this is the ultimate crash course in everything Final Fantasy featuring characters from across the 30-year old series. Players will control siblings Reynn and Lann as they explore the world of Grymoire, encountering classic Final Fantasy characters to help, and battling and collecting classic Final Fantasy monsters in a unique battle system of stacking monsters on top of each other, creating towers to battle with. This is the same game as the one released on PlayStation 4 back in October 2016 but with additional characters and monsters to meet on your journey. Best of all, we don’t have to wait long for this title as it is due to release on Tuesday 6th November. Next up we have Final Fantasy VII and IX that, along with controversial omission Final Fantasy VIII, represent the best of Final Fantasy from the Playstation 1 era. These have already been released on plenty of other platforms before but the first time we have ever seen them on an Xbox console. Final Fantasy VII see’s players control Cloud Strife, a former SOLDIER, who teams up with renegade group Avalanche to take down the mighty Shinra Corporation. Not only that, but this is the Final Fantasy game that features that Aeris/Aerith character, and that moment still breaks players hearts over 20 years later. Final Fantasy IX is a much more traditional setting and players play as Zidane who – along with his Tantalus Theatre Troupe – decide to kidnap Princess Garnet, the heir to all of Alexandria. Fortunately for them, Princess Garnet wanted to escape the castle anyways and the troupe then face the difficult task of keeping her safe whilst her mother, Queen Brahne, sends all kinds of forces against them to take back her daughter. It is likely that both of these will be the same updated versions that PC and PlayStation owners have. After these we have Final Fantasy X|X-2 HD Remaster and Final Fantasy XII: The Zodiac Age. Both of these games are complete remasters of their original PlayStation 2 versions. Final Fantasy X|X-2 HD Remaster is actually two games in one and tells the story of Tidus and Yuna. The first game focuses on Tidus as he becomes a Guardian for Yuna, who has taken it upon herself to rid the world of Sin by completing the grand pilgrimage. X-2 the centres around Yuna and her companions Rikku and Paine as they search for answers during the Eternal Calm. Final Fantasy XII: The Zodiac Age is the remaster of Final Fantasy XII that flew under the radar when originally released, due to its untimely release on the PlayStation 2 just as the PlayStation 3 was gearing up for release. Since this remaster that launched last year it has gone onto critical acclaim as a game that was way ahead of its time. In this game, players control Vaan, who one day dreams of being a sky pirate in the world of Ivalice. He becomes broiled up instead in a fight to save his homeland from the clutches of the Archadian Empire. Considered by many as ‘Star Wars in a Final Fantasy’ it will certainly feel familiar to fans of the space opera. All the other games are due for release in 2019. How many of these will you be picking up? For me, each one is a day one purchase, and it looks like I will have to take the whole of 2019 as holiday to get through them all. Which ones are you excited to play first, let us know in the comments below!